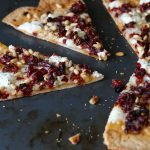 This recipe for Goat Cheese Pizza with Sun Dried Tomatoes & Pine Nuts is my go-to recipe when I need a break from kid pizza! I can only eat cheese and pepperoni pizza so many times before I need a more sophisticated flavor. Not to say that this pizza isn’t for kids! 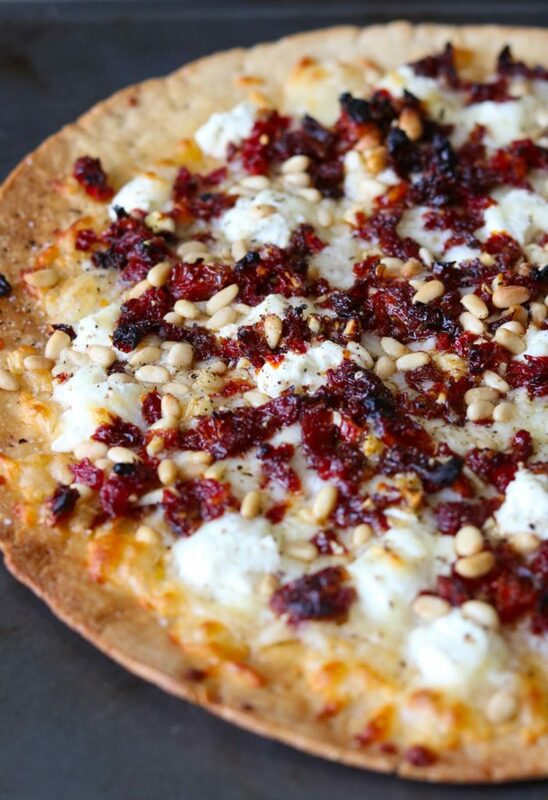 If your kids like goat cheese and sun dried tomatoes they are going to LOVE this pizza. 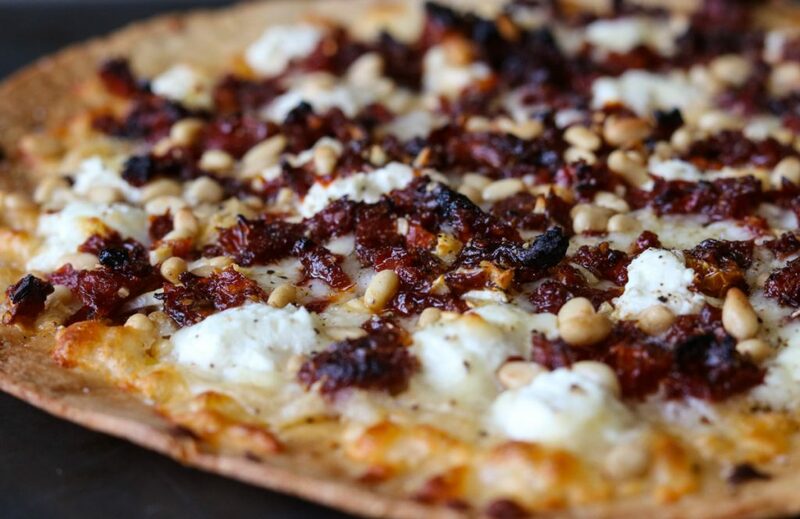 Goat Cheese Pizza with Sun Dried Tomatoes & Pine Nuts is a delicious blend of fresh garlic, caramelized sun dried tomatoes, creamy goat cheese, mozzarella, toasted pine nuts, and extra virgin olive oil. All those yummy ingredients get layered on top of a thin and crispy store bought pizza crust, giving you the short cut you deserve in the kitchen. I take a shortcut and use a store bought pre-cooked pizza crust in this recipe. It not only shaves time off your prep, it shaves cooking time too. I love the idea of making my own pizza crust. However, my schedule does not love the idea of me making my own pizza crust. Truly the pre-made thin crusts that you can get in the store are really good. And once you top it with all your yummies they are perfect! Just make sure you buy the thin crust pizza… for those crispy edges. YUM! This pizza could not be easier to make. Especially since you are using a store bought pizza crust. If you work quickly you can have dinner on the table in 15 minutes! 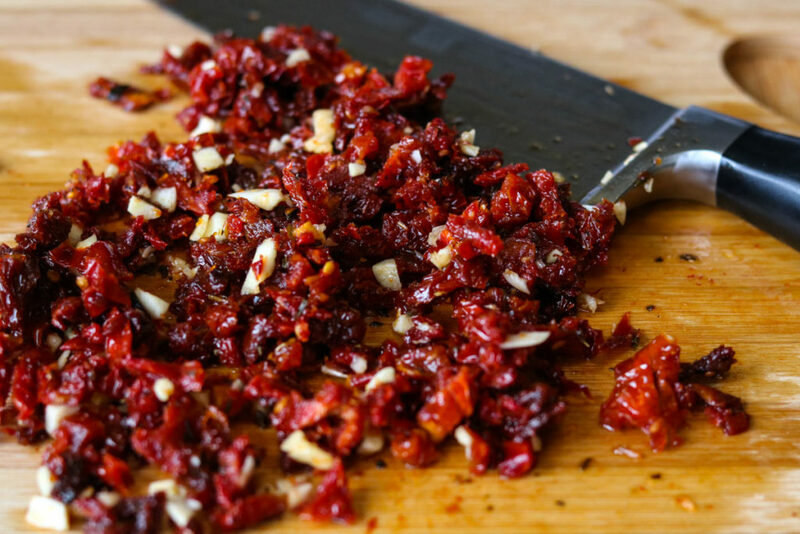 When you open your jar of sun dried tomatoes you will want to reserve 1-2 tablespoons of the oil. If your sun dried tomatoes are coming out of the fridge and the oil is solidified, scoop some tomatoes and oil into a microwave safe bowl and pop them in the microwave for 30 seconds, or until the oil is melted. After you reserve your oil, drain the additional oil from the 1/2 cup of tomatoes. Then chop the tomatoes and garlic together. Set those aside. Place your pizza crust on a flat baking sheet. Since you are using a thin pizza crust some of the oil may seep to the bottom of the pizza crust. That is why I recommend using a sheet pan and not placing the pizza straight on your oven rack. 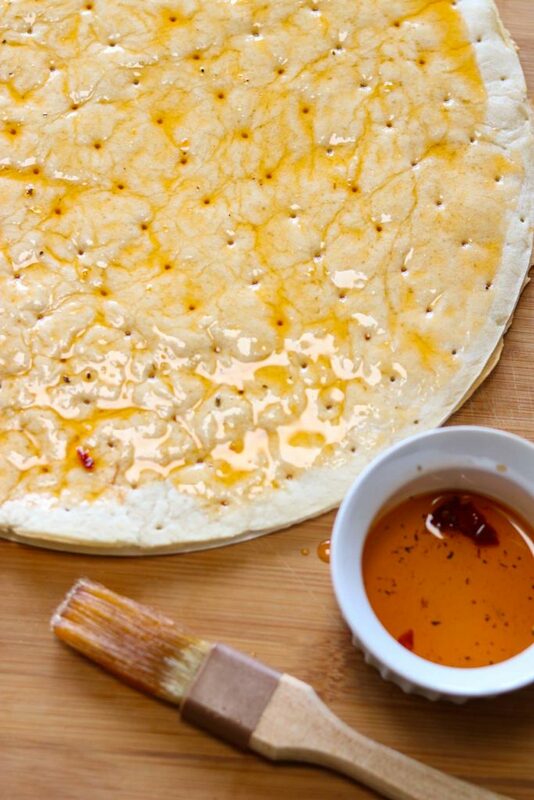 Using a pastry brush, bbq brush, or clean hands apply the reserved sun dried tomato oil generously to the pizza crust. Now crumble your goat cheese over the pizza crust (Tip: your goat cheese will crumble much easier if it is straight out of the fridge). Top that with the mozzarella cheese. Next sprinkle the sun dried tomato-garlic mixture over the pizza evenly. Now top that with pine nuts, salt, and a drizzle of extra virgin olive oil. Pop it in the oven for 6-8 minutes until the cheese is bubbly and the crust is golden and crispy. When the pizza comes out of the oven let it rest for a few minutes before cutting it into slices. I LOVE having this pizza for dinner or lunch. If I eat if for lunch I will eat it by itself, no sides. For dinner I cut the pizza into 8 slices and make a big caesar salad with garlic croutons and black olives. It is a perfect blend of flavors! Goat Cheese Pizza makes an amazing appetizer! It is great for a happy hour, cocktail party or drinks and appetizers before dinner. Just cut it into smaller pieces, about 12 slices makes nice little 3 bite pieces. Get your greens in. Add chopped fresh spinach, basil, or arugula. I would recommend adding it right after you add the tomato-garlic mixture. Then add the pine nuts, salt, and EVOO. Add a few dollops of pesto for a saucier pizza. Try swapping the goat cheese out for feta cheese. I might sneak some kalamata olives on there too. If you really want a protein on your pizza you could add some mini pepperonis or crumbled- cooked italian sausage. I would add that after you add both cheeses, then continue with the other toppings. Swap the mozzarella for a shredded italian blend, shredded provolone, or gruyere. Did you love this recipe? Don’t be shy, share the recipe with your friends over social media. The buttons at the top of the post make it super easy to share on Pinterest & Facebook, or to send in an email. I would love it if you shared… and Google would love me if you shared. LOL! But, really if you love it let me know. Comment below, drop me a line or message me on facebook. If you share a pic of your pizza on social media tag me @momsdinnerinsta on Instagram or @momsdinner on Facebook. 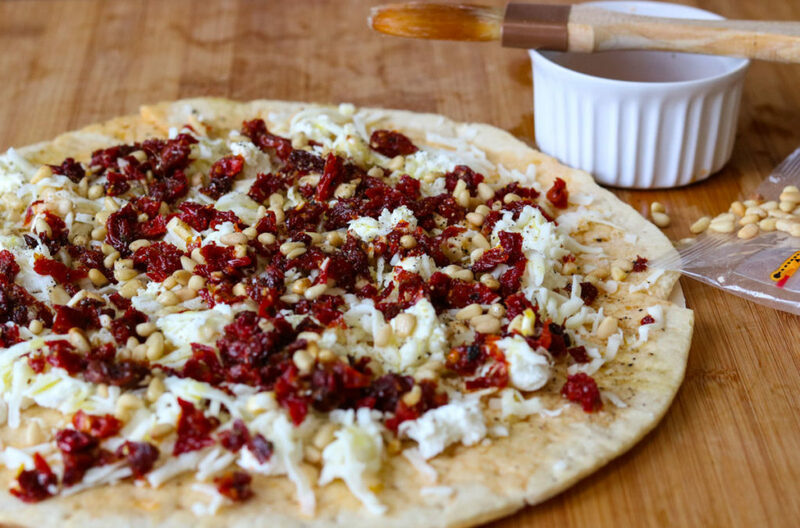 I hope you give this recipe for Goat Cheese Pizza with Sun Dried Tomatoes and Pine Nuts a try in your kitchen. A delicious pizza that easy to make and great for lunch, dinner or appetizers. Set the 9" pizza crust on a flat baking sheet. With a pastry brush, bbq brush or clean hands apply the sun dried tomato oil very generously to the pizza crust. Crumble the goat cheese and shredded mozzarella evenly over the pizza crust, leaving a 1/2 inch border around the edge. (Tip: the goat cheese will crumble easier if it is cold, straight out of the fridge). 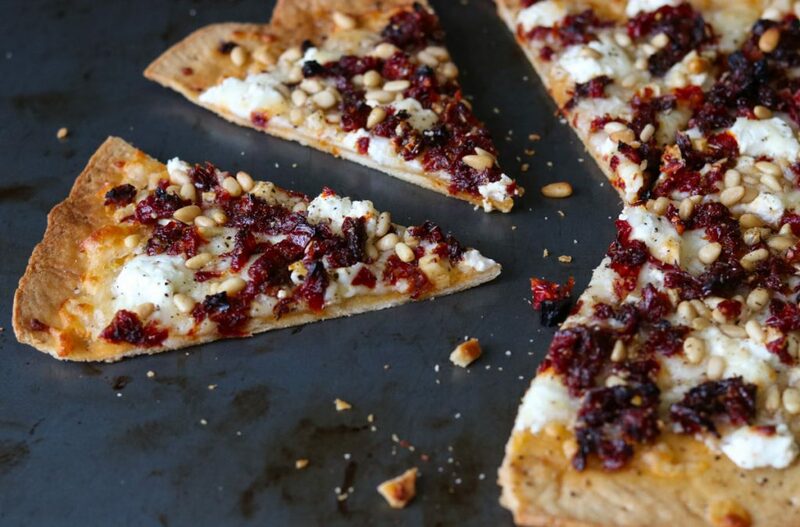 Spread the sun dried tomato - garlic mixture and pine nuts evenly over the cheese. Sprinkle the pizza with 1/4 tsp salt and black pepper to taste. Drizzle some extra virgin olive oil over the pizza. Place in the preheated oven for 6-8 minutes until the cheese is bubbly and the crust is golden brown. Seriously, you had me at goat cheese. And sun dried tomatoes. Oh, and pine nuts. So many good things here. I’m glad my boyfriend likes goat cheese because we will be eating this sometime soon I hope! Ohhhh pizza! I need this! Love that this has goat cheese! I loooove goat cheese too.. unfortunately my husband does not. I guess that’s just more pizza for me! This looks like a fun new idea for topping pizza! Thank you! 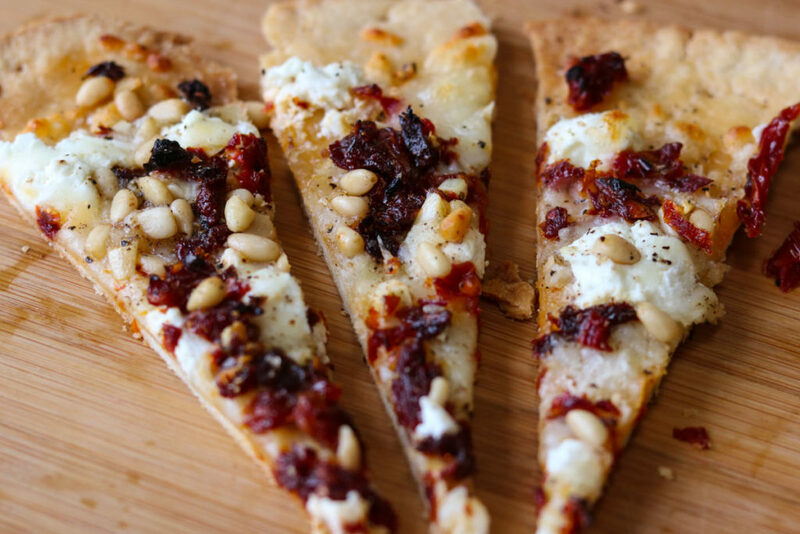 I love goat cheese and sun dried tomatoes together.. pine nuts are delicious too! This is my kind of pizza! I love that you brush the crust with the sun dried tomato oil – brilliant! I bet this is SO flavorful. Thank you!! 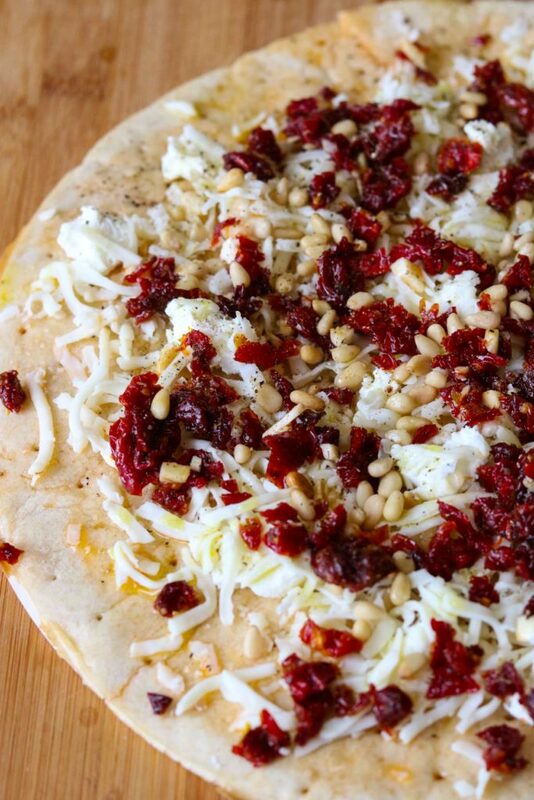 It is packed with flavor, yet you can taste each flavor seperately- garlic, goat cheese, sun dried tomatoes, pine nuts and mozzarella. Who doesn’t love pizza! And when it’s interesting and unique like goat cheese pizza i’m all game for it. Looks delicious! Yummy! Just how I love my pizza crispy and thin! I love the combo of goat cheese and sundried tomatoes! Perfect! This looks so good and I can’t wait to try it! Me too! I love how crispy the crust gets, especially the edges! I love trying new pizza recipes! I cannot wait for this one! You will love this one! It only takes 15 minutes to throw together and cook. Perfect busy night dinner.